When you look up all the different ghost stories from Ohio, you realize the Birthplace of Aviation boasts enough creepy content to warrant more attention than a few attack ads every election cycle. Ohio urban legends read like a greatest hits of the urban legends of our country. You looking for Bigfoot? You got it. How about a bridge featuring the screams of drowning children? Sure. What about an entire town that’s full of every urban legend trope known to man? The Buckeye State's got you, boo. When it comes to getting spooky-ooky, Ohio delivers. Along with some genuinely frightening ghost stories, the Buckeye state hosts its share of quirky cryptids you won’t find anywhere else. Ghost stories from Ohio form the basis for a lot of the urban legends you hear in modern-day America. Whether you’re listening to a story about an old night watchman tasked with guarding a run-down ore refinery or a haunted reformatory, these are the kinds of stories making up the backbone of America’s hauntings. It’s possible the ghost stories of Ohio influenced the rest of the country's tales, or maybe the people who live in the heart of it also tell all the scariest stories. Either way, there exists a wonderful cross section of hauntings, urban legends, and straight-up weird stuff in Ohio. It turns out that the Cincinnati Music Hall is super haunted, mega haunted even. When a steamboat exploded in 19th century Cincinnati, the bones of hundreds of people got displaced all over the city. In the end, the remains were placed in a field which eventually became the foundation of the hall. Further down the line, it was revealed the hall also stands atop of an old orphan asylum and Civil War hospital, because if you're gonna be haunted, best cover all your bases. Built in 1881, the Franklin Castle was originally meant to house the Tiedemann family, a group of wealthy German immigrants who couldn't stop dying. First, the fifteen-year-old daughter, Emma, died of complications from diabetes, followed by the family's grandmother and three more children. These five deaths gave people the idea that something was up in the Castle, or that the patriarch, Hannes Tiedemann engaged in nefarious activities. Secret tunnels built into the house over the years led to theories that he used them to commit heinous murders, while others conjecture Mrs. Tiedemann had them constructed to escape her overbearing husband. For the next hundred plus years the Castle served a number of strange purposes. In the '40s it sold to the German Socialist party, which spurred rumors it allegedly served as a base for Nazi spies. Another family, the Romanos, moved into the house in the '60s and experienced so much paranormal phenomena they invited the Northeast Ohio Psychical Research Society to investigate their home. Apparently, one of their members ran from the building screaming. It's final sale to the Muscatello family further enshrined its eerie history; their searches of the house eventually led to the discovery of human remains in the tower. And even all these years later, the terrible luck of the Tiedemann's continues to follow the house to this day. If you drive through Lake County Ohio late at night and happen to see something that resembles a pack of hydrocephalics staring out at you from the tall grass, you might have stumbled across the fabled Melonheads of Ohio. Allegedly, the government ran a number of experiments which eventually left a group of humans with heads swelled to enormous sizes. Obviously, the government found little to do with a bunch of big noggins, so the story goes they got dumped off in the woods near Kirtland, Ohio, not far from Cleveland. But because every story gets retold, more paranormal theories have been proposed about the Melonheads. Some believe them to be the ghosts of children who burned to death in a cabin fire. The children were subjected to tests by a man named Dr. Crowe, whose work caused their heads to inflate to their larger size. Regardless of their origins, the Melonheads get sighted the most at Wisner Road, where many high schoolers go in an attempt to witness them firsthand. 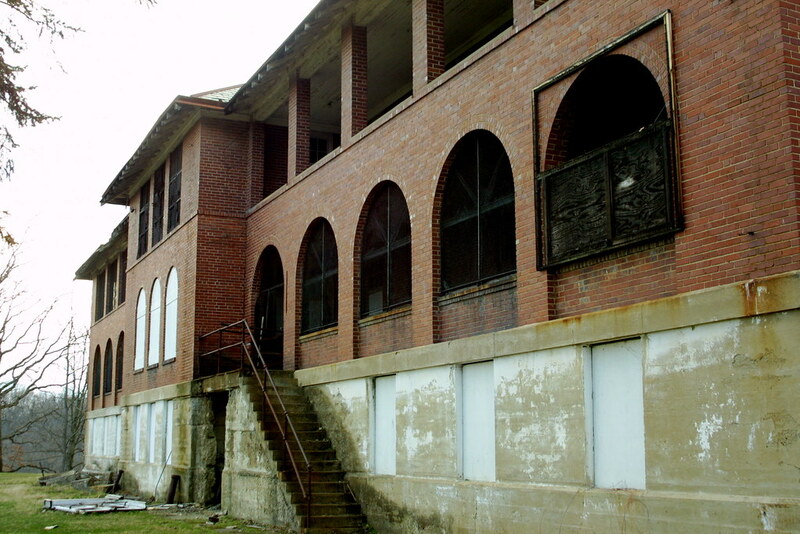 Known to locals as "the Ridges," this hospital was one of Ohio's largest asylums for the mentally ill. As these stories normally go, it began to admit more and more patients to get free labor for the for-profit farm adjacent to the facility, leading to overcrowding. Patients were beaten, lobotomized, strapped down for days at a time - this place was basically a machine built to make ghosts. While plenty of spooky stories surround this place, the creepiest is that of Margaret Schilling, who went missing from the hospital in 1979. Forty-two days after she disappeared, someone discovered what was left of her body in an abandoned wing of the facility, completely naked and with her clothing neatly folded next to her. Margaret decayed so much a gooey imprint of her body seeped into the concrete; no matter what the staff did, they couldn't scrub out the blight. It's said that on clear nights, Margaret can still be seen trying to escape the room where she died.